The Department of Physical Education was established in the year 1983 with B. P. Ed. (one year) course in Physical Education and then M.P.Ed. 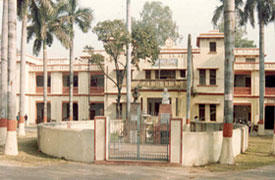 (One year) course was started from 1984-85 sessions under Faculty of Humanities M.G.K.V., Varanasi. Again, after a gap of few years the Department restarted B.P.Ed. One year course in Physical Education and from session 2005-06, M.P.Ed. (Two year) course was started.